Event scheduling in enteliWEB allows occupancy to be associated with specific date ranges or recurrences. Special events or room rentals can be scheduled as one-time-only events. Event descriptions i.e. “Yoga Class” are displayed on the event time block. 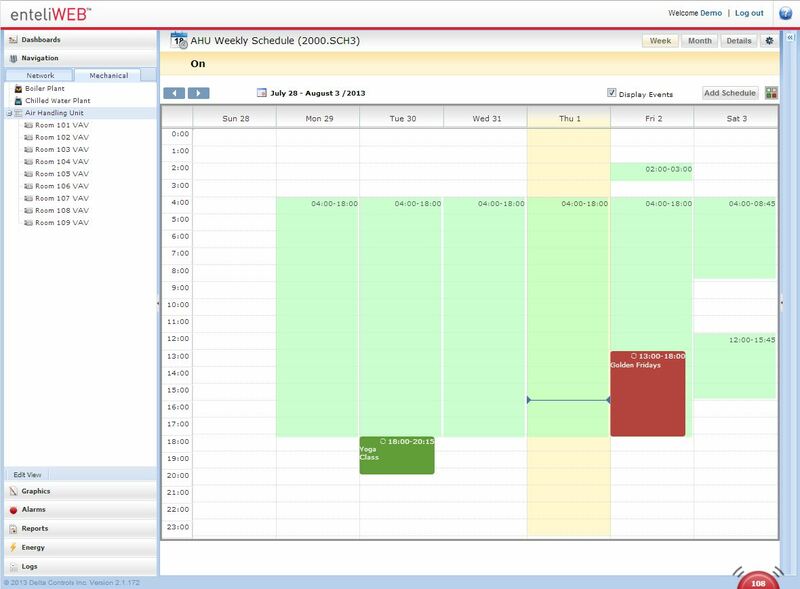 Colors distinguish between weekly schedules, ON events and OFF events. Date ranges, recurring dates and recurring week and day events are supported. This entry was posted in Delta Controls and tagged building management systems, Business, Delta Controls, Event scheduling, facility management systems, Setpoint Systems Corporation on November 5, 2013 by setpointsystems.